When you live on campus, you are part of a vibrant community where you can live, learn and engage with your peers. You'll also have various opportunities to engage in college life outside of the classroom. 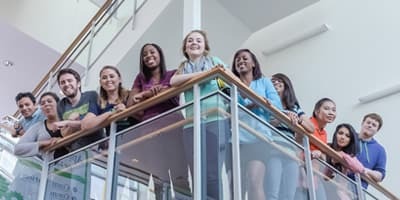 Living on campus offers quick and easy access to your classes, the library and other student resources, as well as campus events and activities. Live with your friends, have your study partners nearby, and meet other students. 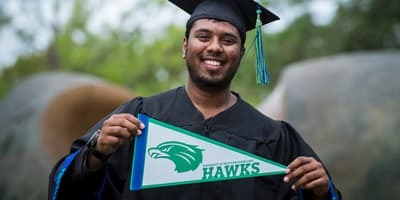 Engage your fellow Hawks, staff and faculty in conversations, programs and activities that will enhance and expand the knowledge you have of your community and the world. An enriching campus living experience can add so much to your overall college career, so keep reading to explore your options. Live your best campus life right in the heart of all the daily UHCL action! The personal privacy of spacious individual rooms is balanced by exciting resident events designed to bring the University Forest Apartments (UFA) community together to mix and meet. While you're steps away from classes and campus activities, there are even more things to do on-site. From active pursuits, sand volleyball, and swimming, to the clubhouse, coffee bar, 24-hour study center, and laundry, we've got you covered, day and night! Parents and students will love the convenience of The Hub by Amazon and our 24-hour on-call staff, peer leaders and a professional maintenance team. Whether you choose to live independently or with a roommate, University Forest offers a variety of options to fit your lifestyle, and you can even bring your pet! Make University Forest your home away from home. Check out our room layouts, pricing, amenities, and much more. Living on campus has never been more exciting. 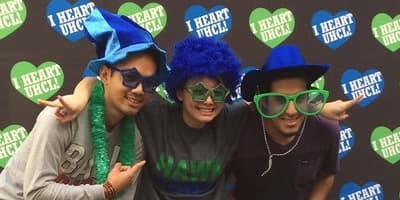 Join the UHCL family with our newest on-campus living community (Hunter Hall), located in the heart of campus, and enjoy all that campus has to offer right outside of your door! Our UHCL Residential Life staff is excited to welcome you to a vibrant community where you can engage your peers academically and socially. Enjoy the comfort and convenience of suite-style living spaces with components of community-style living in the shared common areas. Throughout the hall, you will find quiet study spaces, a large community lounge area, and a spacious community kitchen. In addition, you will have access to laundry facilities (included in-housing fees) on each floor, mailboxes and a full-service front desk. Like at UFA, you will encounter welcoming and friendly live-in staff who are available 24/7, and are trained to assist and respond as needed, specifically in emergency situations. If Hunter Hall sounds like the place for you, fill out a Housing Interest Form, and select the "Explore Hunter Hall" button below to learn more about room layouts, pricing and other frequently asked questions.